The Planning Commission on Monday afternoon approved the first phase of a major residential development on top of Aetna Mountain above Black Creek. Doug Stein, one of the Black Creek partners, said he foresees completed homes on the mountaintop by the end of next year at the community that will be larger than all of Lookout Mountain, Tn. First, the road up the mountain has to be completed. Developers are awaiting final city approval before pushing ahead to the top. Mr. Stein said, "This will be like no other residential community. It's not a retirement community or a golf community. It's just a community. We want it to be a multi-generational place to live. Already we've got four generations of the same family at Black Creek by the golf course." He said studies show that family members live longer when they are clustered with their immediate family members. Andy Stone, a developer who has been called in from Nashville to give a final push to the project, said he was taken aback by the spectacular site. He said, "You won't find a more beautiful piece of property so close to a city. It's incredible. There's nothing like it." Mr. Stone, who started working on the project in June 2016 while still living in Nashville, said he and his family will be moving here soon. He is a cousin of Stein partners, Bobby and Gary Chazen. The first phase of 224 acres will include three miles of walking trails and 100 acres of open space. There will be a community center as well as a convenience store to serve the first mountaintop residents. The trails and open space will be available to the public at the ungated mountaintop community. Some 1,200 acres will be under a conservation easement. There will be a spectacular overlook near where the new road reaches the top of the mountain. Mr. Stein said, like Lookout Mountain's Point Park, it will be open to the public to enjoy. He said the developers want to follow the pattern of Adolph Ochs, who preserved thousands of acres on the side of Lookout Mountain. He said, "It's why the view toward Lookout is so much better than that of Signal." 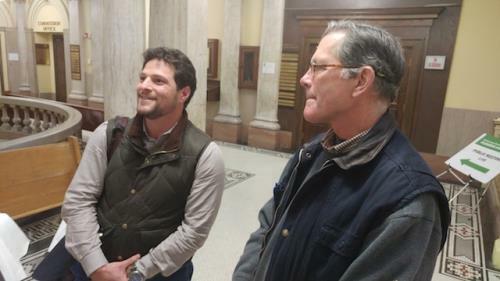 Mr. Stone said every effort is being made to retain the site's natural beauty, including a ban on clear cutting and development on steep slopes. There is ample level land for houses on the mountaintop, it was stated. Mr. Stein said houses will not be allowed on the edge of the bluff, but must sit back some distance so as not to stand out in the viewshed from below. Those who cut down trees without getting permission face fines of $100 per inch. The new road will mainly follow a different track than the old Aetna Mountain Road that dates to before the Civil War. The old road will be put into use as a hiking trail. Mr. Stein said the new road will wind up costing more than the $9 million that was obtained through the issue of bonds in a Tax Increment Financing (TIF) District. He said several small subdivisions, including The Knolls and The Ridges that are partway up the road, are already paying in to the TIF fund. The utilities for the mountaintop community will be installed along the road underground, including electric, water and sewer. It is a 1,000-foot rise from the bottom of the road to the 1,960 elevation at the top.